I believe that UX and UI are fundamentally a series of problem solving exercises required to link an idea or concept to its perfect digital solution. The implementation of a UX framework to support collaboration, thorough problem evaluation, interpretation and exploration is critical to the process of building a solid case for the UI conclusions. All problem solving requires the ability to negotiate ambiguous situations on the journey to a solution, and this cannot be more true than when dealing with innovative business cases. The connection of ideas to solutions requires a structured approach of requirements gathering, workflow analysis, architecture, prototypes, workshops, user testing, validation activities and creative UI design methodologies. The benefit of treating project design as equally important as the technical development has enabled new products to avoid many of the pitfalls of closed shop development models. Collaboration is an art – It is a cultural model that requires cross-discipline understanding of research, technical, creative and business/commercialisation objectives. For true collaboration to exist it requires organisation, planning, management and space for the team to explore possible project solutions. My current contract role as Senior UX/UI Designer and project coordinator with QUT’s Visualisation and eResearch group (ViseR) is a good example of the type of work experiences I have had throughout my career. I am working with Professors from the Centre of Excellence for Mathematical and Statistical Frontiers of Big Data, Big Models and a Senior Research Fellow in Biostatistics at the Cancer Council Queensland alongside a group of 10 project advisors made up from researchers from RMIT, Monash and the technical teams from the Queensland Cancer Council and developers from QUT VisR. The problem the project team and myself have successfully tackled is the delivery of an Australian Cancer Atlas. As the Senior User UX/UI designer I have taken the project from a requirements document breakdown through initial concepts, wireframes, mock-ups, workshops and I am currently coordinating a national set of focus/user testing sessions. 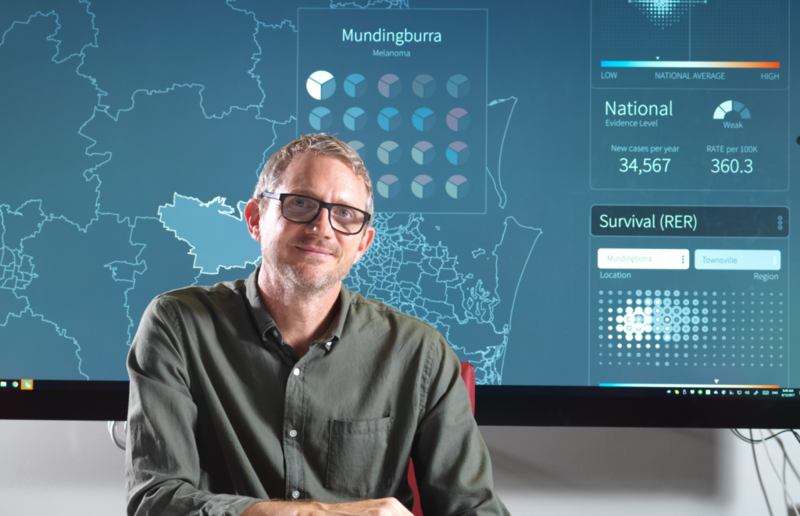 The projects core challenge is the visualisation of uncertainty based on the output from the scientific modelling of the individual cancer indicators.